The Gamevice is a cleverly designed controller that transforms an iPhone into a handheld console – but it’s pricey and has some flaws. 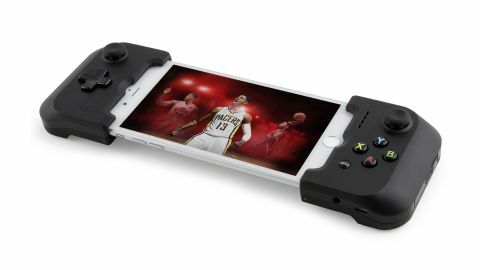 Gamevice is designed to turn your iPhone into a handheld console with ‘proper’ controls. Rather than skidding your fingers across a glass surface, or waggling your phone around to steer a car, you get a D-pad, buttons, analogue sticks, and triggers. Set-up is simple: plug your iPhone into the Gamevice’s Lightning port, and shove the other end into the other half of the Gamevice. If you’re using a non-Plus iPhone, a slider tightens the back of the controller to keep everything fairly snug. The end result looks a little like a PS Vita. The unit is light, weighing about the same as an iPhone 7, and there’s no battery – the Gamevice draws power from your iPhone, reportedly at about the same rate as a pair of headphones. You do, however, get a pass-through Lightning port, for when your iPhone’s low on juice, and a headphone port, which will send some iPhone 7/7 Plus owners into rapture. Neatly, the two halves of the unit when freed from an iPhone snap together with magnets – nice and compact for travelling. In use, the Gamevice proves broadly impressive. The triggers are solid, the analogue sticks work very well, and the D-pad’s fine. The four face buttons are sometimes a little unresponsive, which during testing caused a few deaths in platformers, and cars not always accelerating in driving games. Bigger problems are the Gamevice only being suitable for landscape-format games, a noticeable wobble/flex on the left-hand side, and its relatively high price. There’s also the question of whether it’ll work with future iPhones if Apple messes with the form factor (notably, if they get even thinner). Despite such grumbles, the Gamevice does get a guarded recommendation. It’s a smart, coherent design, and the best option for iPhone gamers hankering after physical controls. Twenty bucks off the price tag and it would get another star.